This Pinot Gris is dry in style with great pear and citrus aromatics and beautiful creamy texture with distinctive acidity. Zingy aromas of pear, grapefruit zest and cherry blossom on the nose lead to a long and vibrant palate of crunchy pear, fresh lime and baked apple which is complemented by a creamy mouth-filling texture and mineral finish. 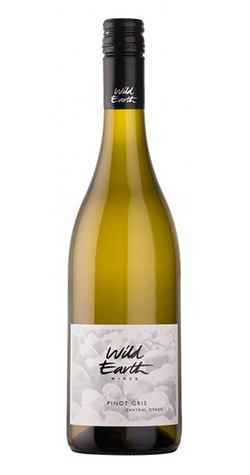 The Pinot Gris grapes that created this beautiful wine came predominately from established vineyards in the Gibbston Valley (15-year-old vines), with 15% sourced from a higher altitude site in Pisa. The 2017 growing season was uniquely cool leading to small bunches and light crops without disease pressure which enabled us to craft a dry style Pinot Gris with incredible drive and freshness. This wine was made from three separate ferments which were later blended to create a harmonious wine. The grapes for the first batch were foot stomped and pressed to a stainless-steel tank for a cool fermentation. This resulted in a slightly weightier component with beautiful phenolics. The second lot was whole bunch pressed and fermented at cool temperatures, this highlights the fresh aromatics of Gibbston. Both tanks were left on lees for about three months until blending. The Pisa component was pressed to old barrels which fermented to dryness and contributed to the texture of the wine. The resulting Pinot Gris is dry in style with great pear and citrus aromatics and beautiful creamy texture with distinctive acidity. Just like the many other wineries of the pristine areas of Central Otago, our pride and passion is our Pinot. Our clay, schist, silty loam soils and alpine climate produce a wine that is one of a kind. Each year the precious terroir gifts us luscious bunches of Pinot pleasure. With each exciting vintage, we are blessed with a new understanding, as caretakers of this land. Our hearts bloom in Bannockburn's Felton Road. We are a small family owned winery who produces award-winning Pinot Noir and also some wonderful examples of aromatic Pinot Gris, sweet and dry style Rieslings and beautiful Pinot Noir Rosé and we are now onto our third Chardonnay Vintage! We only use French oak for barrel maturation.